Part of the joy of being in Istanbul apart from the beauty of its geography and its monuments is its food. And on our second trip – the first being an escorted tour that barely left us any time in the city – we were determined to explore its amazing culinary delights. Our first few moments were spent in Sultanahmet, soaking in the sheer magic of the beautifully lit monuments and the mesmerizing rhythm of the call to prayer. Nowhere else on earth does the Muezzin’s call, sound quite like this! Ravenous after the sensory overload, we stopped at a little restaurant for fragrant lentil soup and Gozleme (stuffed pancakes) ending with sublimely refreshing Salep (orchid root) ice cream from Mado which was to become my daily sugar fix. Day one was allocated to the sights we had missed on our previous trip; the Topkapi Harem, the Archeological Museum and the exquisite Mosaic Museum. Disappointingly the ‘Ancient Near East’ section of the Archeological Museum was closed for renovations, so we missed seeing the ‘Treaty of Kadesh’ – a clay tablet – the only surviving copy of the oldest peace treaty in existence, between the Hittites and Rameses ll of Egypt. A simple and delicious lunch of white bean salad and Koftes at Tarihi Sultanahmet Koftesi and we were all set to explore the Tahtakale area behind the Grand Bazaar ending at the beautiful Rustum Pasha Mosque. Next was the Spice Bazaar reminding us of the fun we had on our last visit, getting bespoke scents mixed at Orhans! After stocking up on Sumac and Sour Pomegranate sauce we cut across to the Galata bridge for a sunset view of the Golden Horn, and a good, cheap snack of balik-ekmek (fish sandwiches). After a tour of the Dolmabahce Palace this morning we took the ferry to Kadikoy – on the Asian side – for lunch at Ciya, started by chef Musa Dagdeviren known as something of a “culinary anthropologist”. We had read rave reviews and were looking forward to a special lunch but were not as wowed as we expected to be. We really enjoyed walking around Kadikoy though, returning around sunset. It was now time for mezze & Raki (potent anise flavoured liquor) at our favorite Meyhane, Bonchuk on Nevizade street. We couldn’t wait to taste their speciality, Topik (potato and bean casing filled with a paste of roasted onions, raisins and pine nuts) again. We moved the next day from Sultanahmet to our second hotel, in Beyoglu, a previously run-down district, now reincarnated as the city’s after-hours playground. Our next stop was Kanyon Mall in the swank Levent neighbourhood, more for its architecture than the shopping. Back on Istiklal we grazed on yummy street food: stuffed mussels and clam sandwiches and Icli Koftes and profiteroles (from Inci pastanesi)! More walking, a shower & snooze later we were ready for dinner at Antiochia nearby. We loved the Durum (Lavash bread rubbed with red pepper and spices), the mezze, the ubiquitous kebabs and the almost Parisian Café atmosphere. Even the aubergine dessert (!!) was weirdly wonderful! You cannot come to Istanbul and not cruise the Bhosphorus. So off we went sampling yoghurt at Kanlica and later disembarking at Sariyer. 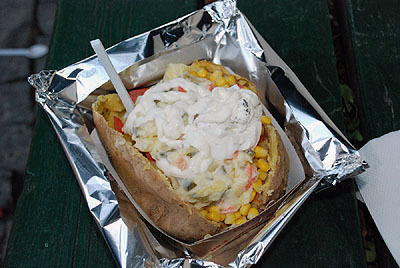 Then a taxi ride to Ortakoy and we just had to stop for Kumpir, (an Istanbul take on the baked potato) from a stall on the square. We watched as this guy split the hugest cooked potato and began mixing in an assortment of toppings including cheese, corn, peas, vegetable salad, pickled beets etc! Delish! A whole meal by itself, but we shared one since we had more treats to sample yet! Treats that guaranteed extra ‘padding’ for our trip back home. 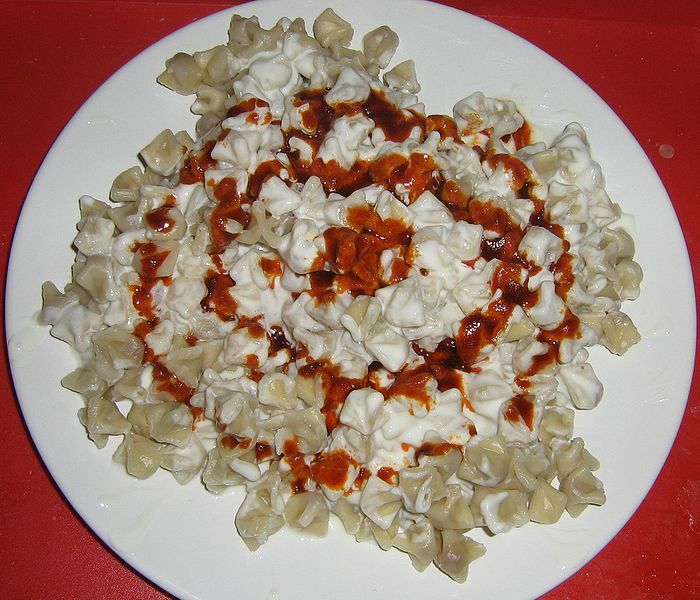 Lunch was lip-smacking good Manti, tiny pasta parcels enclosing morsels of meat and doused in a garlicky, yoghurt sauce. We strolled around Taxsim in the evening and had our fortunes read at Melekler Kahvesi (Coffee House). Great fun! Worth drinking the thick black ‘mud’ that is Turkish coffee for! The concert at the Galata tower that night was very atmospheric and we dined at a fish restaurant called Furreya within sight of the Viennese Tower! Fresh salads, fantastic grilled Sea bass and butter fried prawns. A good change from all the kebabs of the past few days. On impulse we climbed up to 360 on the way back, for after dinner cocktails and fabulous panoramic night views. All in all a great day. On our last morning we took the Tunel (Vintage underground funicular) to Karakoy for our stock of Gulluoglu Baklava to take home. 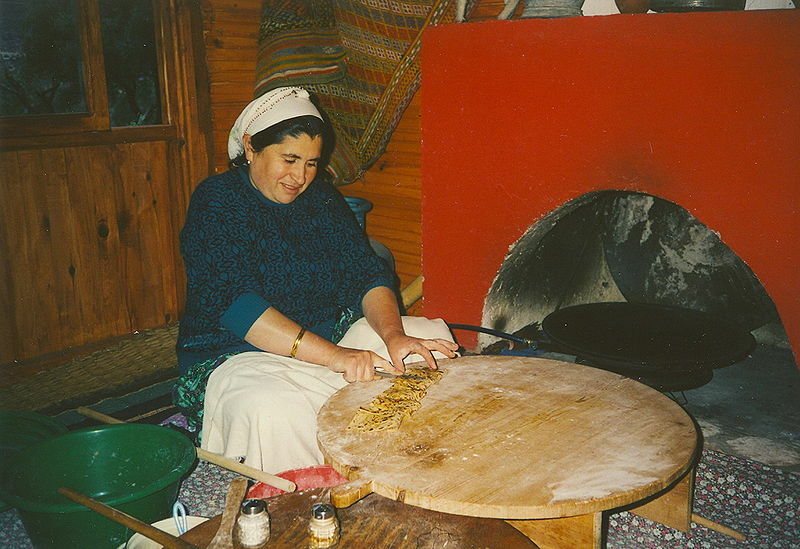 Picked up Simits – sweet bread rings – from a vendor outside and stopped for delicious Turkish tea (pronounced Chay!) to sustain us till lunchtime. Next we browsed around the “tony” boutiques in Nisantasi. Finally, a leisurely lunch at ‘Sofyali 9’ of memorable mezze and hot fluffy Pita breads was a fitting finale to our fantastic culinary journey. I remember reading somewhere that three parameters define a great city- history, beauty and a friendly people. We would add great food to the list and Istanbul we think has it all and is right up there at the top of our list of favourite cities! This post is in response to Ailsa’s Travel Theme – Food. Note: This is my first post without any images of my own(apart from the header), since I hardly ever took photos of food during my pre blog days. Shall post another entry soon, with the few that I do have. si, there is so much to see, to experience, and it’s often difficult to know which to pursue and which to nudge away from the table! nice problems to have! MY MY! It all looks so wonderful. Oh Madhu, I shouldn’t have read this before breakfast. Now scrambled eggs is going to seem pretty dull! What a wonderful array of photos and descriptions! Oh my goodness, I think I gained weight just reading this! You make everything sound wonderful… the Topik sounds awfully good, as does everything else. Great post! Madhu! What a brilliant degustation of the culinary delights of Istanbul! I’m a little envious of you both taking a special trip, just to savour the delights of living in the city for a few days, eating your way through the day’s delights, interspersed by a little sightseeing, shopping and concert going. A wonderful holiday indeed! I couldn’t agree with you more – good food, and places to partake of it – are essential ingredients of a great city, which Istanbul certainly is. I’ve just read this after lunch….now I’m hungry again. Great post with such delicious foods presented for us. Apologies for the inconvenience Angeline 🙂 But thanks! Well what an endless feast your trip was!!! you must have gone home 10 pounds heavier 🙂 I only had three days in Istanbul as part of a tour but will go back an do it slowly sometime. I stayed between Taksim and Galata overlooking the Horn so this brings back memories! Those tours never leave you with much time, especially in the big cities. We spent a couple of extra days on the first visit and still couldn’t manage to fit in everything. So this providential return with another couple was very welcome. Glad you liked it Gilly. I guess I need a week then, irrespective of the food. I need to see that sunset of the Golden Horn since you didn’t provide photographic evidence! Five days at a minimum Jo. You can’t do Istanbul justice in two days. You might be able to rush through the main sites, but you won’t experience the city. That would be such a pity. I love kebabs! That’s what I acquired in staying in the middle east for quite a while. Informative post! Thanks for sharing! I do too Nelson and these are very different from the Indian ones. Although I prefer the spices in the Indian versions, the meat here doesn’t taste as good. Thanks for the comment. Excellent work Madhu ,I love it . Thanks Jake, glad you enjoyed it. I love, love, love the food in Istanbul… and the atmosphere makes it all the more delectable!! My dad just came back from Turkey and said the food was phenomenal. I can’t wait to visit one day! Everything looked decadent! Just one more place to put on my bucket list! Turkey should be high on your list L&T! It has the best of both worlds, the East and the West! What an exquisite culinary delight experience in Istanbul! Truly it’s a beautiful and culturally rich city! Thank you, Madhu! You are welcome Amy. You would love Istanbul! Turkey and Egypt are on my list… Thanks to your inspiration! The Gulluoglu Baklava was decadent! We brought several boxes of the dry variety home. I remember we had some sensational ones in Athens as well. Thanks Marina. …must admit that Gulluoglu is the best one! Madhu, yummy and delish food. For me the local food is a big part of travel as much as the sights to see because food is so much part of the culture. Looking forward to your next post. Madhu, I’m waiting eagerly for the Chennai culinary treats. Do you travel a lot within India too? Even this early in the morning – right after breakfast, the photos make me hungry enough to want to eat again. Thank you Judy, even if these are not my photos 🙂 Glad you enjoyed my culinary journey. Looks like a great trip! I have been craving pita and kabob for the last week or so, this is has turned it into something I’ll have to look after soon. I haven’t been to Lebanon, where the food is supposed to be sensational by all accounts, but the pitas in Turkey were way better than those we had in Egypt or Jordan! Even the tiniest restaurants have their own ovens! Oh, I want some now! I have been wanting to go to Istanbul forever! My husband used to go there on work pretty regularly, and would come back and tell me all about rekye and the amazing kebabs. 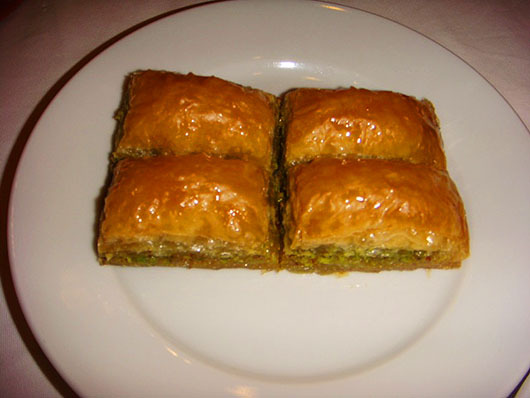 The baklava there is amazing. I stored mine in the freezer and ate it sparingly over a whole month! Envy you the ability to eat them sparingly! Mine didn’t last very long 🙂 Thanks Meenakshi, hope you get there soon. Thanks for taking me back to my top city in the world. My mouth is watering from the Kumpir photo. Geesh, I am hungry! Mine too! The photos actually don’t do them justice. Thanks for the visit and comment. Sure look delicious. I must try some of them. Thanks. Madhu…what a delight this all was. I am still stuck at ‘orchid root’ – do they use orchid roots as in flower orchids to make ice cream ??? http://en.wikipedia.org/wiki/Salep. There is apparently a longstanding dispute between the Greeks and Turks over the origin of the Ice cream 🙂 Thanks Jo. Apologies Jeff 🙂 Just recounting how we ate our way through Istanbul! Wish I had stopped to click a few pictures. These are really culinary delights, Madhu. I wish I could taste right now. That is unfortunate Cardinal, must drastically limit your choices. I am sure even the Salep will be classified as gluten. Couldn’t you request for gluten free kebabs? Madhu, just reading your descriptions of each dish is making me hungry. I’m glad I’m reading this just before and not after dinner! I am something of a carnivore so Turkish food is a guilty pleasure – I’m not surprised you got converted right then and there in Istanbul! Did you get to try İmam bayıldı (“the Imam fainted”) on your travels? It’s braised aubergine stuffed with onion, garlic and tomatoes and then simmered in olive oil. 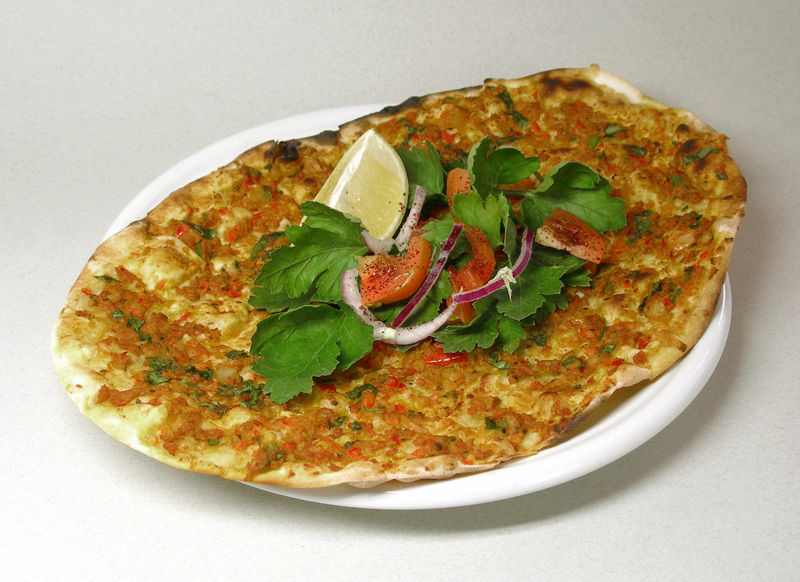 Along with lahmacun – which I actually prefer over pizza! – it’s my favourite Turkish dish. After reading this I think I would happily fly for a week to Istanbul and go nowhere else; that sheer combination of history, culture and amazing food is just unbeatable! Yes we did try the Imam Bayildi and Muammara and Fasulye and lots more. I love aubergine and would not have a problem being vegetarian in Istanbul. The only thing that was on our list that we failed to taste was the salt baked fish that our friend who had lived there for a while, kept raving about. 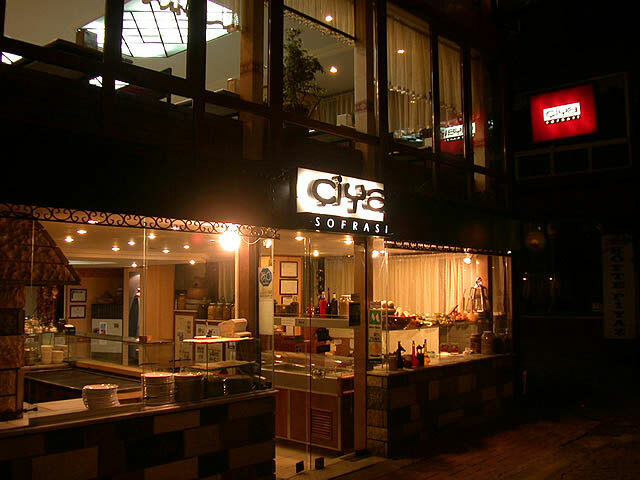 You must have amazing Turkish restaurants in HK. Lucky you! Thankfully we do have a handful – in recent years Turkish, North African and Middle Eastern food have been gaining a little bit of momentum! Funnily enough the last time I had Imam bayildi was in Germany late last year. Missed out on the sahlep though! Turkey is in our top 5 next destinations and I am certain we could eat their food everyday! This is one of my favorite posts in a long time! Thank you so much Michael. I have no doubt you will love Turkey. Looks yummy! One of the pleasures of traveling is trying out the local cuisine. I hope to see Istanbul someday. My hubby went there on business a couple of years ago and loved it. I don’t know anyone that did not fall in love with Istanbul 🙂 Thanks Fergiemoto. You will love Istanbul Suzanne. Will you be doing Cappadocia and Ephesus as well? Let me know if you need any suggestiona. I booked the latter for my daughter and she was very happy, but the first appears to be cheaper and has great reviews on TA. Would love to visit Istanbul one day – and now even more so! Ah yeah, I had to change my diet earlier this year… I eat mostly Protein (Meats, Dairy & a little Tofu) and Vege’s these days… Hardly any Sugar, Bread or Pasta… But you get used to it.